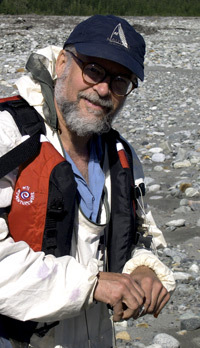 Kevin Plunkett on the shore of the Tatshenshini River. 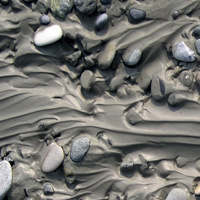 Pebbles and silt in the Tatshenshini flood plain. From our Vermont studio I can look in one direction at apple trees, another view looks out over our pond and up to the hills across a small valley. I have always felt the joy of being in nature, not just observing it, and often ski, hike, and swim in the nearby fields, forests, and ponds. Occasionally I venture further afield backpacking in the Northeast, Alaska, or the Southwest with my family. These experiences, while renewing body and spirit, are transformed and reinterpreted in my work. Influenced by geological features and flowing water, I like to use asymmetric and flowing lines and contrast these with different textures and patterns. I work in gold and platinum, incorporating traditional and unusual gemstones and other natural objects. Wedding and engagement rings are popular, but I also enjoy designing fibulae (an ancient pin form) and a wide variety of other jewelry. I have been making jewelry with my wife Kay since 1969. Prior to pursuing my jewelry career, I earned a degree in mechanical engineering and helped develop high precision machine tools. Although primarily self-taught as a jeweler, I rely on my engineering background to compliment my artistic expression with structural integrity and functional grace. I have developed my skills over a lifetime of experimentation and study, with an openness to accepting challenges and discovering innovative approaches. It is important to me to strike a pleasing balance of form, function, composition, material and technique. Aside from being beautiful, jewelry should be technically well executed, complement and adorn the body, and comfortable to wear. Combining all the elements of my skills and artistic sensibilities, and using a variety of materials, forms, colors and textures gives my work a quality that reflects my love of the natural world. Site and photographs © 2004 Plunkett Works. Designs © 1969 - 2004 Plunkett Works.